AMBALA, Haryana, India (December 18, 2014)—While Bhai Gurbaksh Singh Khalsa’s hunger strike for the release of Sikh political prisoner has entered its 35th day, it is not apparent whether the government is sincere in considering his demands or not. The governments have given no clear indication in taking action to release the Sikh political prisoners for which Bhai Khalsa is observing a hunger strike at historical Sikh Gurdwara Lakhnaur Sahib Patshahi Dasveen near Ambala. Bhai Khalsa had lost by 16.5 Kg during the fast. As per doctors, Bhai Khalsa is going to be a cage of bones which is a matter of concern. As winter has arrived, Bhai Khalsa’s body needs more energy, but due to his fast his health condition would deteriorate further in coming days. Talking to journalists on Wednesday, Bhai Khalsa said he would continue his struggle till the release of Sikh political prisoners who are languishing in various jails of India despite the completion of their prison terms. He said he is not struggling for his personal interests but for the interests of the Sikh nation. He said it was a grave injustice to imprison someone despite the completion of his term. He said he had not been contacted by the government so far. However, he expressed hope that the union government would make efforts to resolve the issue. On the other hand, Jaswinderpal Singh, personal secretary of appointed Jathedar of Sri Akal Takht Sahib Giani Gurbachan Singh, said that the Jathedar had taken up the issue with Punjab Chief Minister and Sikh members of Parliament who had assured him to do persistent efforts in this direction. Senior BJP leader Sukhminderpal Singh Grewal said that he had met Bhai Khalsa yesterday and afterwards met Indian home minister to take up the issue. He said process of releasing Bhai Lal Singh Akalgarh and Bhai Waryam Singh has started. He contended that a lack of documents is the biggest obstacle for their release. Some media sources said that most of the cases against Sikh detainees were not filed by state governments but by central intelligence agencies that proves big obstacle for the release. However, no clear indication has been received whether government is taking action in this regard. 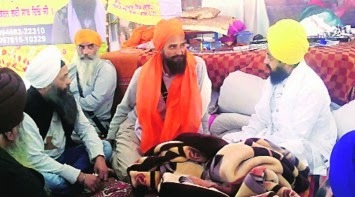 Sikh leaders have expressed grave concern over the deterioration of Bhai Khalsa’s health condition. Almost all the Sikh groups from Punjab and abroad are showing solidarity with his struggle and making appeals to the masses of Punjab through various means. His press secretary Bhai Gurpreet Singh Guri said that on the 34th day of hunger strike, Sikh Sangat from India and abroad arrived there to meet Bhai Khalsa in large numbers. He said that Gurdwara management committees of Gurdwaras of Canada have sent a memorandum to Indian Prime Minister Narendra Modi through the governer. In the memorandum, Sikh sangat sought the demands of the hunger strike be met. Besides others, Baba Gurdev Singh chief Sahibzada Fateh Singh Tarna Dal along with his Jatha met Khalsa, journalist Baltej Pannu, Amrinder Singh Arora, Baba Parmjit Singh, Balwinder Singh, Jaimal Singh, Iqbal Singh, Mai Bhago Society Ambala. Aam Aadmi Party Senior from Punjab Ricky Walia also visited Gurdwara Lakhnaur Sahib to support Bhai Khalsa.